For first, these things also had begun to appear to me to be defensible; and the Catholic faith, for which I had fancied nothing could be said against the attacks of the Manichæans, I now conceived might be maintained without presumption; especially after I had heard one or two parts of the Old Testament explained, and often allegorically — which when I accepted literally, I was killed spiritually. 26. But having then read those books of the Platonists, and being admonished by them to search for incorporeal truth, I saw Your invisible things, understood by those things that are made; Romans 1:20 and though repulsed, I perceived what that was, which through the darkness of my mind I was not allowed to contemplate — assured that You were, and were infinite, and yet not diffused in space finite or infinite; and that Thou truly art, who art the same ever, varying neither in part nor motion; and that all other things are from You, on this most sure ground alone, that they are. Of these things was I indeed assured, yet too weak to enjoy You. I chattered as one well skilled; but had I not sought Your way in Christ our Saviour, I would have proved not skilful, but ready to perish. For now, filled with my punishment, I had begun to desire to seem wise; yet mourned I not, but rather was puffed up with knowledge. 1 Corinthians 8:1 For where was that charity building upon the foundation of humility, which is Jesus Christ? 1 Corinthians 3:11 Or, when would these books teach me it? Upon these, therefore, I believe, it was Your pleasure that I should fall before I studied Your Scriptures, that it might be impressed on my memory how I was affected by them; and that afterwards when I was subdued by Your books, and when my wounds were touched by Your healing fingers, I might discern and distinguish what a difference there is between presumption and confession — between those who saw whither they were to go, yet saw not the way, and the way which leads not only to behold but to inhabit the blessed country. For had I first been moulded in Your Holy Scriptures, and had Thou, in the familiar use of them, grown sweet unto me, and had I afterwards fallen upon those volumes, they might perhaps have withdrawn me from the solid ground of piety; or, had I stood firm in that wholesome disposition which I had thence imbibed, I might have thought that it could have been attained by the study of those books alone. 10. Wherefore, since it is our duty fully to enjoy the truth which lives unchangeably, and since the triune God takes counsel in this truth for the things which He has made, the soul must be purified that it may have power to perceive that light, and to rest in it when it is perceived. And let us look upon this purification as a kind of journey or voyage to our native land. For it is not by change of place that we can come nearer to Him who is in every place, but by the cultivation of pure desires and virtuous habits. 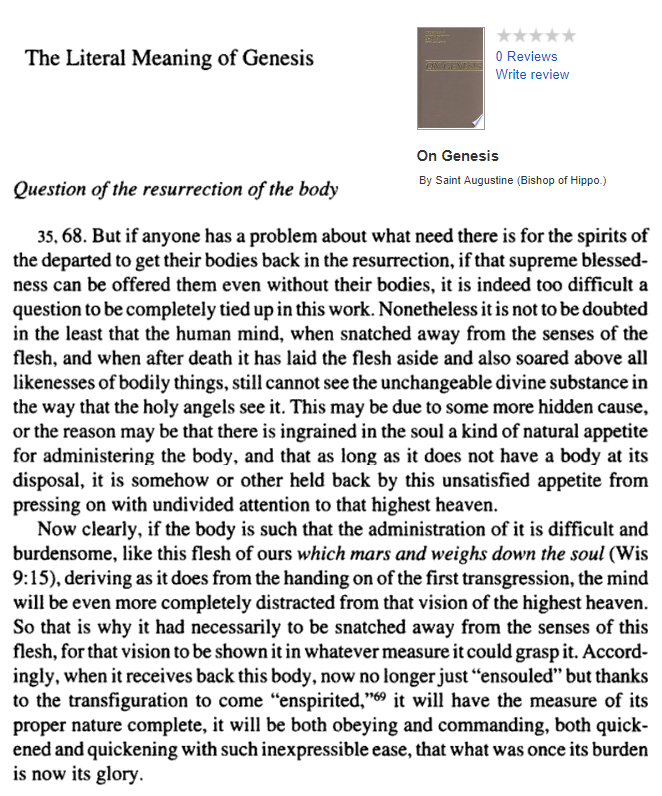 In Book 7 of the Confessions, Augustine sets out for us what was perhaps the most important shift in his understanding of God, a shift to a position that basically remained with him until his death.10 He tells us that he had originally conceived of God as an extended, and perhaps infinitely diffused, material substance. Augustine tells us that the most fundamental problem he saw with this account was that God’s materiality must imply God’s divisibility (conf. 7.1; cf. 7. 5). However, through reading some ‘books of the Platonists’ at the same time as he was returning to his Christianity, Augustine came to a new account of God. This account involved five interrelated and, for Augustine, inseparable elements. These elements are described at Confessions 7.10.16 ff. First, Augustine realised that God was the ‘light’ of Truth itself’: immaterial, eternal and everywhere and indivisibly present. God was the immaterial source of all perfections and of all Truth. Second, Augustine understood that God was distinct from all, and yet calling to and drawing all things towards Truth through a benevolent providence. Third, Augustine saw that God was Being itself. ‘Truth itself’ was identical with the real source of all existence, and thus the incorporeality and infinity of Truth itself did not mean that God was literally nothing (nihil). Fourth, Augustine reasoned that all things that are not Being itself exist only by participation in God and through the gift of Being from God. Thus, he could say of himself, ‘unless my being remains in Him, it cannot remain in me’ (conf. 7.11.17). Fifth, Augustine discovered a paradoxical relationship between the soul and God. On the one hand, the soul was immaterial and ‘above’ the material reality of the body, and when discovered to be such served as a pointer to the nature of God. On the other hand, the soul was still mutable and served only to reveal the incomparable and infinitely surpassing reality and ‘light’ of the divine. If we were to add one more point to this list, but a point that does not appear at Confessions 7.10.16, it would be that God was ‘simple’. At Confessions 4.16.28 Augustine describes God as ‘marvellously simple and unchangeable’ (mirabiliter simplex atque incommutabilis). This is taken to imply the foolishness of trying to think of God as subject to accidental predication: imagining God as ‘having’ greatness or beauty as qualities of a divine ‘nature’ or ‘substance’. Instead, God is inseparably and eternally greatness or beauty itself. There is no division possible between being and attributes in the God who ‘simply’ is those qualities that we want to predicate of God. Divine simplicity is treated as an essential corollary of Augustine’s conception of God as immaterial, unchangeable and as Truth itself (although it is by no means simply a ‘Neoplatonic’ idea). But since He so took the form of a servant, as that the unchangeable form of God remained, it is clear that that which became apparent in the Son was done by the Father and the Son not being apparent; that is, that by the invisible Father, with the invisible Son, the same Son Himself was sent so as to be visible. Why, therefore, does He say, Neither came I of myself? This, we may now say, is said according to the form of a servant, in the same way as it is said, I judge no man. 10. If, therefore, He is said to be sent, in so far as He appeared outwardly in the bodily creature, who inwardly in His spiritual nature is always hidden from the eyes of mortals, it is now easy to understand also of the Holy Spirit why He too is said to be sent. For in due time a certain outward appearance of the creature was wrought, wherein the Holy Spirit might be visibly shown; whether when He descended upon the Lord Himself in a bodily shape as a dove, or when, ten days having past since His ascension, on the day of Pentecost a sound came suddenly from heaven as of a rushing mighty wind, and cloven tongues like as of fire were seen upon them, and it sat upon each of them. This operation, visibly exhibited, and presented to mortal eyes, is called the sending of the Holy Spirit; not that His very substance appeared, in which He himself also is invisible and unchangeable, like the Father and the Son, but that the hearts of men, touched by things seen outwardly, might be turned from the manifestation in time of Him as coming to His hidden eternity as ever present. In what way did He come but this, The Word was made flesh, and dwelt among us? [John 1:14] Just as when we speak, in order that what we have in our minds may enter through the ear into the mind of the hearer, the word which we have in our hearts becomes an outward sound and is called speech; and yet our thought does not lose itself in the sound, but remains complete in itself, and takes the form of speech without being modified in its own nature by the change: so the Divine Word, though suffering no change of nature, yet became flesh, that He might dwell among us. For instance, the Dolbeau sermons make abundantly plain that, when Augustine preached, his statements were by no means the ex cathedra statements of the representative of a securely established Catholic hierarchy. Brilliant, urgent and, at times, intransigent, his sermons are better described as ‘dialogues with the crowd’.’ They are often inconclusive dialogues. One senses in them the constant presence of the unpersuaded, the indifferent and the downright disobedient. We do not hear the voice of a man confident that, as a Catholic bishop, he had been called to rule an entire society. Indeed, the very urgency and trenchancy of their tone betrays how little authority Augustine actually wielded over his hearers. In 1975, Johannes Divjak of Vienna (on mission from the Austrian Academy, to catalogue all manuscripts of Augustine in European libraries) found a mid-fifteenth century manuscript in the Bibliothèque Municipale of Marseilles. Produced in around 1440 for King René of Anjou, a rich but unfortunate monarch, the author of a courtly novel in the best late medieval manner, The Story of a Heart Caught by Love, the manuscript had been known, but had not been closely examined. It was assumed that an elegant late medieval manuscript could hardly contain any new work of an author as frequently copied as was Augustine. Hence the surprise of Johannes Divjak when, on examining the text, he found that it contained, added to a standard collection of Augustine’s letters, twenty nine other letters, of which twenty seven (many of them very long) were utterly unknown. Known now as the Divjak Letters, these twenty nine letters tell us in great detail about hitherto unknown events and about the activities of Augustine as a bishop in Roman North Africa in the last decades of his life: the longest and most vivid of them range from between 419 and 428. Yet again, in 1990, François Dolbeau perceived that an apparently uninteresting, badly-copied manuscript of the late fifteenth century, recently catalogued in the Stadtbibliothek of Mainz, contained groups of sermons known previously only through titles in Possidius’ Indiculum and through Carolingian library lists of sermons and a few, short extracts. They were first announced to the learned world as the Mayence Sermons (from the French word for Mainz, the place of their discovery) and are now known as the Dolbeau Sermons, from their discoverer. One cluster of these sermons represents Augustine’s preaching at Carthage in the spring and summer of 397—that is, in the crucial year of the beginning of his career as a bishop, at a time when the Confessions were already forming in his mind. The other group of sermons takes us to Carthage and the little towns outside Carthage in the late winter and spring of 403-404, at a time of urgent reform in Catholic worship combined with new Catholic aggression against pagans and Donatists. In On Christian Doctrine, Augustine developed principles and rules for the interpretation of the Scriptures. In so doing, Augustine provided important and influential contributions to rhetoric, education, theology, and hermeneutics. Augustine’s hermeneutical theory should be understood in relation to his Neo-Platonic background and his attempt to come to grips with the incarnation of the divine wisdom. The Platonic chorismos schema—namely, the distinction between the changeable and unchangeable, the temporal and eternal—provides the background theory to his rules of interpretation. The changeable should be interpreted in relation to the unchangeable, the temporal to the eternal, the world to the transcendent, historical events to the divine plan of salvation, and the human Christ to the divine Word. Augustine’s hermeneutical theory bases signification on the ontological priority of the unchangeable eternal to the changeable and material. This conviction (concerning the ontological priority of the transcendental reality over the material sign) leads Augustine to his basic principle of hermeneutics: what is of primary importance is not so much our knowledge of the material sign that enables us to interpret the eternal reality, but rather it is our knowledge of the eternal reality that enables us to interpret the material sign. This hermeneutical principle applies not only to allegorical and typological but also to literal interpretation. To understand the words of the Bible properly as signs of eternal reality, one must acknowledge that reality. 60. Moreover, if those who are called philosophers, and especially the Platonists, have said anything that is true and in harmony with our faith, we are not only not to shrink from it, but to claim it for our own use from those who have unlawful possession of it. 6. Have I spoken of God, or uttered His praise, in any worthy way? Nay, I feel that I have done nothing more than desire to speak; and if I have said anything, it is not what I desired to say. How do I know this, except from the fact that God is unspeakable? But what I have said, if it had been unspeakable, could not have been spoken. And so God is not even to be called unspeakable, because to say even this is to speak of Him. Thus there arises a curious contradiction of words, because if the unspeakable is what cannot be spoken of, it is not unspeakable if it can be called unspeakable. And this opposition of words is rather to be avoided by silence than to be explained away by speech. And yet God, although nothing worthy of His greatness can be said of Him, has condescended to accept the worship of men’s mouths, and has desired us through the medium of our own words to rejoice in His praise. For on this principle it is that He is called Deus (God). For the sound of those two syllables in itself conveys no true knowledge of His nature; but yet all who know the Latin tongue are led, when that sound reaches their ears, to think of a nature supreme in excellence and eternal in existence. For full post, click here. If one is to take Augustine’s words seriously, one must recognize this conversion was not in terms of a Protestant born again experience, but this conversion was a purification resembling the Neoplatonic purification: “The effect of your converting me to yourself was that I did not now seek a wife and had no ambition for success in this world.” To “not seek a wife” is a commitment to celibacy not an admission of guilt, repentance toward God, and belief in the death and resurrection of Jesus Christ. Augustine’s autobiography, Confessions, may be described as a manual on Platonic purification. The first seven chapters represents the struggle against sexual desire, the nemesis of Platonic purification. Chapter eight is the accomplishment of his goal. The final chapters are his self-congratulation on his success. The goal of purification is to become like God in order to see God. The practitioner expects to see God in his mind at the end of the ascent. The ascent is a meditative process, removing oneself from the distractions of physical life and seeing God with you mind. The name ascent refers to the Platonic metaphysical system of the pagan philosophers. God is at the top of the “ladder”, all creation is an ordered descent from the top. In order to reach God, it is necessary to ascend the ladder. Ascent is only possible through a process of purification. For first of all the things began to appear unto me as possible to be defended: and the Catholic faith, in defense of which I thought nothing could be answered to the Manichees’ arguments, I now concluded with myself, might well be maintained without absurdity: especially after I had heard one or two hard places of the Old Testament resolved now and then; which when I understood literally, I was slain. Many places therefore of those books having been spiritually expounded. And because God commanded them one thing then, and these another thing now for certain temporal respects; and yet those of both ages were servants to the same righteousness, whereas they may observe in one man, and in one day, and in one house, different things to be fit for different members, and one thing to be lawful now, which in an hour hence is not so; and something to be permitted or commanded in one corner, which is forbidden or punished in another. Is Justice thereupon various or mutable. The Manichaeans believed God could not be mutable and retain his perfection. Augustine accepted this philosophy as true and attempted to prove this doctrine with Scripture. In another writing, On the Morals of the Catholic Church, Augustine explained the doctrines of the Old Testament that were so absurd. In explaining his dispute with the Manichaeans we observe his agreement with them against the literal interpretation of the Old Testament. We do not worship a God who repents, or is envious, or needy, or cruel, or who takes pleasure in the blood men or beasts, or is pleased with guilt or crime, or whose possession of the earth is limited to a little corner of it. These and such like are the silly notions . . . the fancies of old women or of children . . . and in those by whom these passages are literally understood. . . . And should any one suppose that anything in God’s substance or nature can suffer change or conversion, he will be held guilty of wild profanity. Augustine agreed with the Manichaeans that a mutable God was totally unacceptable. In this conflict between the Platonic doctrine of immutability and the literal interpretation of Scriptures what had to change? Augustine’s answer was that the literal interpretation of Scripture had to change. For Augustine the plain narratives of Scripture had to be reinterpreted by spiritual or allegorical methods. The Manichaeans believed the Old Testament revealed a God who was mutable or could repent. Since the Platonists believed that God was immutable this idea of God repenting was a source of ridicule for the Catholic Church. Augustine was so embarrassed by these arguments that he chose to reinterpret Scripture rather than refute the Platonic philosophy.